A board-certified physician in family medicine, Dr.Toyin Fapohunda-Adekola is a graduate of the University of Medicine & Dentistry of New Jersey.With experience as a health columnist for a women's magazine, Fapohunda-Adekola enjoys presenting intriguing medical knowledge in a demystifying manner. She strives to awaken the self advocate in us all. Influenza is a seasonal viral disease that typically causes symptoms of fever, chills, headache, stuffy nose, sore throat and muscle aches. Fever and muscle aches are typically among the first symptoms to develop. Muscle aches are caused by the immune system's response to the viral infection and typically last from three to eight days. An over-the-counter pain reliever can help alleviate muscle aches caused by the flu. Prescription antiviral medication can also shorten the duration of the flu, if taken early in the course of the illness. Most people with the flu experience muscle aches. A November 2000 "JAMA Internal Medicine" article reported that 94 percent of people with the flu experience muscle aches. When a person with the flu coughs or sneezes, tiny droplets containing infectious virus enter the air and environment, where they can spread to others. As the flu virus multiplies in the nose and airways, the immune system swings into action. Inflammatory chemicals called cytokines are released as the immune system fights the virus. Muscle aches from the flu are believed to be caused by high levels of cytokines in the body, according to the 2012 medical text "Influenza Complete Spectrum I." Muscles aches caused by the flu are usually felt in the arms, legs and back. In some cases, even the muscles of the eyes can be affected. The achiness ranges from mild to severe, and is usually worst during the first few days of the illness. A rare complication of the flu called myositis develops in some people. With myositis, muscle inflammation and tissue breakdown causes severe muscle tenderness. This complication most commonly develops in children, and most frequently in the calf muscles, notes the 2011 book "Influenza: Complete Spectrum II." Children sometimes refuse to walk because of leg pain and tenderness. Flu symptoms begin one to four days after infection with the virus. A high fever and muscle aches are among the first symptoms to develop. Muscle aches commonly last about three days, but may continue for as long as eight days before gradually diminishing. Development of the flu-related complication myositis usually occurs early in the illness. Symptom improvement typically occurs within a few days, but may take as long as a month, according to an August 2004 article in the journal "Infection." Flu symptoms usually begin to improve within three to five days, but full recovery can take as long as two weeks in some people. Although the flu can be debilitating, the infection is manageable. Prescription antiviral medicines can shorten the duration, symptoms and complications of the flu, especially if given within the first two days of coming down with the illness. As of 2016, oseltamivir (Tamiflu), zanamivir (Relenza) and peramivir (Rapivab) are recommended by the Centers for Disease Control and Prevention. 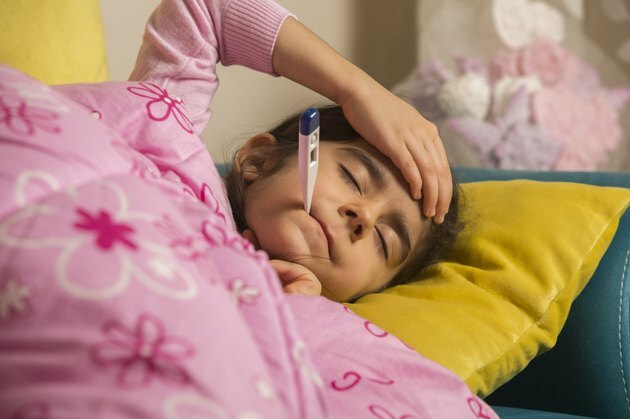 Antiviral treatment is recommended particularly for people at high risk of flu complications, including children younger than 2, adults 65 or older, pregnant women and people with certain preexisting medical conditions. Over-the-counter pain relievers such as acetaminophen (Tylenol) and ibuprofen (Advil, Motrin) may also help relieve muscle aches and other flu symptoms. Other illnesses -- some potentially life-threatening -- are sometimes mistaken for the flu. For example, an infection of the nervous system called meningitis may present with flu-like symptoms of severe muscle aches, fever and chills, in addition to neck pain and stiffness. In young children, ear infections may produce flu-like symptoms, and the baby may refuse to nurse or take a bottle. Pneumonia also begins with symptoms similar to the flu that are frequently accompanied by a persistent and often wet cough. Doctors have various tests available to determine your diagnosis so that you receive the right treatment. Seek immediate medical attention if you have flu-like symptoms along with: - shortness of breath or difficulty breathing - a high fever that lasts longer than two days, or breaks and then returns - dizziness, fainting, drowsiness or confusion - inability to eat, or persistent nausea and vomiting - a new rash. Principles and Practices of Infectious Diseases, Eighth Edition; John E. Bennett, et al.